November is the busiest and most active month of the year outside the office for the SBID team. 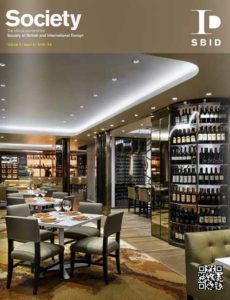 It’s the month the SBID International Design Awards reaches its crescendo. We hosted guests from around the world at two events in the same week. The tour of the House of Lords culminated with afternoon tea on the terrace, while the awards ceremony was held at The Dorchester hotel, our usual venue of choice and another historic British institution. Keeping the awards fresh, innovative and inspiring is entirely dependent on the calibre of minds, concepts and projects from our high-quality entrants. Year on year, submissions and attendance continue to grow and the excellence of entries, finalists and winners always speak for themselves. The portfolio section in this issue has been dedicated to 2014’s winning projects. After a busy, fun-filled November, we are looking forward to a restful close to an eventful and successful year and to making plans for an even better 2015 to come.